Five states bordering on the potentially energy-rich Arctic Ocean have met in Greenland in an attempt to head off a new "gold rush" in the high north. They agreed to settle disputes through the UN procedures in an orderly way. "The five nations have now declared that they will follow the rules," said the Danish Foreign Minister Per Stig Moller. "We have hopefully quelled all myths about a race for the North Pole once and for all." However, there is still all to play for in terms of exploiting resources and it remains to be seen if the procedures are used. Louise de la Fayette, visiting professor at the University of Greenwich said: "I am disappointed that they seem to have rejected proposals for a comprehensive legal regime for the Arctic. "Since they share a common ocean and common challenges and since they already cooperate to a considerable extent, the Arctic states should find the political will to go one step further to organise and consolidate their efforts in a new regional seas agreement." A key aim of the meeting - organised by Denmark and also attended by Russia, the United States, Canada and Norway - was to reaffirm the rules governing rights over the seabed contained in the UN Law of the Sea Convention. This says that a country has the right to drill for minerals up to 200 nautical miles (370km) from the edge of its continental shelf. It can make a claim that the shelf goes beyond that and, if the claim is accepted, rights would then be extended. Already, Russia has made a huge claim on the basis that an underwater feature, the Lomonosov Ridge, runs from Siberia to the North Pole. It argues that Russia owns the rights extending from the ridge, and that would include the North Pole. Last year a Russian submersible planted a metal Russian flag on the seabed under the Pole to illustrate its claim. Russia's claim is currently being considered by a technical panel. Norway has also lodged a claim. A former Canadian Foreign Minister, Peter MacKay, said of the Russian flag expedition: "This is posturing. This is the true north strong and free [a line from the Canadian national anthem], and they're fooling themselves if they think dropping a flag on the ocean floor is going to change anything. There is no question over Canadian sovereignty in the Arctic... You can't go around the world these days dropping a flag somewhere. This isn't the 14th or 15th century." The convention lays down a procedure for settling disputes. It says that if negotiations fail, arguments can be arbitrated by an international panel or the International Court of Justice. However, such arbitration has to be agreed to by both or all sides in a dispute, and it is not yet clear if this would happen. The potential for disagreement is there. 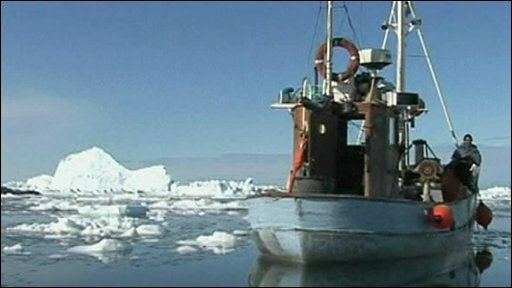 There are number of other disputes across the Arctic, including one between Canada and the United States over whether the fabled Northwest Passage, which is opening up for ice-free transit, is a Canadian or international water. Denmark and Canada are arguing over the small Hans Island between Canada and Greenland. The Danish intention at the meeting was to get the coastal states to commit themselves to the disputes procedures now, and not wait for trouble ahead. There are signs of good intentions at least, though these will have to be tested in practice. The Russian Foreign Minister Sergei Lavrov compared the flag-lowering incident to the US lunar landings, in which the US flag was planted: "There is no claim for any territory. There couldn't be, because there is the Law of the Sea Convention, and there are mechanisms created to implement this convention. "It's important that the five Arctic nations send a clear-cut signal that they do want and are willing to co-operate on the basis of international law." The race to establish claims has been driven by the reduction in sea ice. This opens up the possibility of easier exploration for gas and oil. "Ice loss is really happening," said Simon Belt, professor of chemistry at the University of Plymouth. He went on a Canadian ship through a largely ice-free Northwest Passage last September to see the changes for himself. "It is very serious and has implications not just for mineral exploration. Ice acts as a heat shield for the planet by reflecting UV radiation, and without it the Gulf Stream would also not be what it is today. There is significant ice loss. 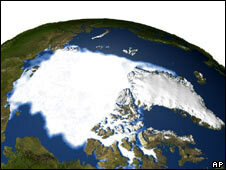 "In September 2005 the reduction in sea ice compared to a 30-year average was 10 times the size of the UK. In September 2007 it was 15 times the size of the UK. This is entirely due to global warming." 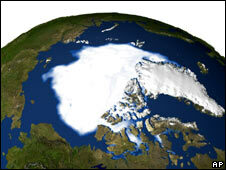 Update 29 May: After an inquiry from a reader, I checked NASA's view of Arctic ice loss. It quotes Goddard Space Flight Center scientist Joey Comiso as saying that ice loss is "most likely a result of warming due to greenhouse gases." However, he adds that other factors might contribute. Hard winds can compact ice, making it cover a smaller area, winds can blow the ice towards warmer waters, causing it to melt and cyclones can introduce warmer air from the south.